Arrested in Quincy in 1983, entered alcohol treatment program. Arrested in Quincy in 1985 for drunken driving, sentenced to 18 months in jail. 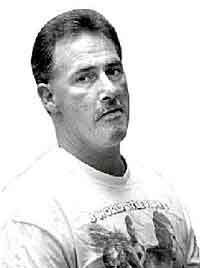 Arrested in Quincy in 1986 for drunken driving, sentenced to six months in jail. Arrested in Hull in 1989, sentenced to nine months in jail for drunken driving, driving with suspended license. Arrested in Brockton in 2001, sentenced to two years in jail. Last arrested Aug. 5. Indicted by grand jury for drunken driving as a fifth offense, the highest level under state law. The case is pending in Norfolk Superior Court. Arrested in Dennis in 1985, entered alcohol treatment program. Arrested in Barnstable in 1986, license revoked. Arrested for drunken driving in Boston in 1991. License revoked for five years. Arrested in Bourne in 2000. License suspended for 90 days for refusing to take alcohol breath test. Last arrested Aug. 8 in Quincy after his car struck two parked cars on Sea Street. His case is going to Superior Court. License suspended for two years in 1990 for possession of a drug with intent to distribute after a traffic stop in Norwell. License revoked for four years in 1993 for being habitual traffic offender. License reinstated in March 1996. Arrested in Easton for drunken driving seven months later. Entered alcohol treatment program. License revoked for four years in 1997 for being habitual traffic offender. Arrested for drunken driving in Pembroke in 1998. Sentenced to alcohol treatment, license suspended for one year. Arrested for drunken driving in Hanson in 1999, license revoked for eight years. Arrested in Whitman in 2002, license revoked for 10 years. Last arrested Aug. 6 after a police chase from Hanson into Pembroke. He was driving with a revoked license.The case is pending. First arrested in 1979 in Braintree, entered alcohol treatment program. Arrested in Hull, , 1982, entered alcohol treatment program. 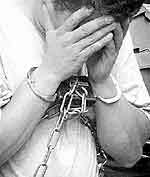 Arrested in Weymouth, Hingham and Hull in 1984. Entered alcohol treatment programs. License revoked indefinitely in 1984 for being habitual traffic offender, reinstated in 1985. Arrested in Weymouth in 1989, license revoked for 10 years. Arrested in Braintree in 1993, driving with revoked license. 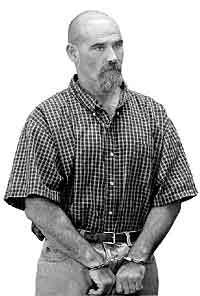 Arrested in Quincy in 1994, license revoked for five years. Arrested for driving with revoked license and open container of alcohol in Quincy, 1997. License revoked for four years in 1998 as habitual traffic offender, reinstated in 2002. Last arrested Aug. 16 in Plymouth. The case is pending in Plymouth District Court. Arrested twice in Pembroke in 1982, sentenced to alcohol treatment program. Arrested in Pembroke in 1987 and 1988, license revoked for 10 years. License reinstated in December 1998. Arrested in Pembroke in April 1999, entered alcohol treatment program. License revoked for refusing blood alcohol breath test after drunken driving stop in Marshfield in 2002. License revoked indefinitely for posing "immediate threat" to other drivers. Case is still pending in Plymouth District Court. Last arrest in Marshfield in May. Pleaded guilty to drunken driving as seventh offense. Also convicted of driving with a revoked license. Sentenced to 21/2 years in jail. Arrested in Scituate in 1986, entered alcohol treatment program. Arrested in Scituate in 1987, license revoked for two years. License suspended for 120 days for refusing blood alcohol breath test after drunken driving stop in Scituate in 1990. Arrested in Cohasset in 1997, license revoked for two years. Last arrested Feb. 23 in Marshfield after police said they saw him swerve into oncoming traffic and make an abrupt U-turn. The case is pending in Plymouth District Court. Arrested in Cohasset in 1980, entered alcohol treatment program. License revoked for one year for drunken driving in February 1985. 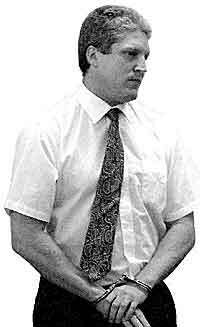 Arrested three times for drunken driving: Braintree in February; March in Pelham, N.H.; July in Marshfield, all in 1985. License revoked indefinitely in 1986 for being habitual traffic offender, but reinstated four years later. 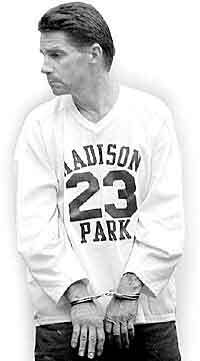 Arrested in Hanson in 1990. License revoked for 10 years, but reinstated eight years later. Arrested in Randolph in 2002. License suspended for four months, but reinstated while case was pending. Last arrest, Aug. 1 in Pembroke. Case is pending.